A brand new architect designed house in the best street in Byron Bay, beautiful stylish, and modern. Backs onto a quite country style lane just an easy 5 minute flat stroll to Main street, Clarke’s Beach, the lighthouse walking tracks and Tallows Beach. The Top Shop is just around the corner for a coffee and a paper. Park the car and leave it, you can walk everywhere. 4 Bedrooms (2 x en-suite) 2 x King size beds 1 x double and 2 x singles to sleep 8, also perfect for a family of 5, or perhaps, two families. Master includes a private outdoor spa bath and shower courtyard for bathing under the stars. 4 Bathrooms. The whole house is mozzie screened. Pool with covered cabana. Large fully netted Springfree trampoline for the kids. 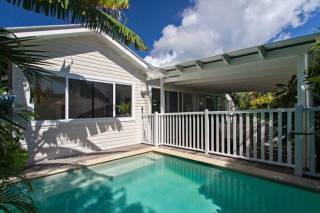 Beautiful open plan living onto covered deck and pool great in all weather conditions. Spacious eat in kitchen with magnificent wooden island bench and Miele appliances. Large fireplace for those winter nights in. Laundry fitted with Miele appliances. Funky soft Media Room. Enormous 2 car garage plenty of room for extra storage. Bring your surfboards, bikes and skateboards, smooth, safe paths surround. Large Vegetable patch The house faces North, to catch the sun and the cooling breeze. It is protected from the cold unwelcome winds by a hill to the South. A Summer Resort provides all the ingredients for a welcoming, truly memorable magic Byron Holiday. When can we expect you? A brand new architect designed house in the best street in Byron Bay, beautiful stylish, and modern. 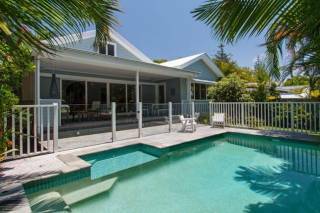 Backs onto a quite country style lane just an easy 5 minute flat stroll to Main street, Clarke’s Beach, the lighthouse walking tracks and Tallows Beach. The Top Shop is just around the corner for a coffee and a paper. Park the car and leave it, you can walk everywhere. 4 Bedrooms (2 x en-suite) 2 x King size beds 1 x double and 2 x singles to sleep 8, also perfect for a family of 5, or perhaps, two families. Master includes a private outdoor spa bath and shower courtyard for bathing under the stars. The whole house is mozzie screened. Pool with covered cabana. Large fully netted Springfree trampoline for the kids. 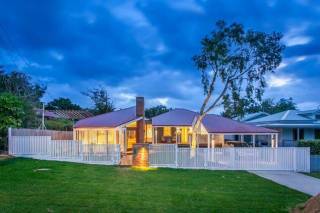 Beautiful open plan living onto covered deck and pool great in all weather conditions. Spacious eat in kitchen with magnificent wooden island bench and Miele appliances. Large fireplace for those winter nights in. Laundry fitted with Miele appliances. Funky soft Media Room. Enormous 2 car garage plenty of room for extra storage. Bring your surfboards, bikes and skateboards, smooth, safe paths surround. The house faces North, to catch the sun and the cooling breeze. It is protected from the cold unwelcome winds by a hill to the South. A Summer Resort provides all the ingredients for a welcoming, truly memorable magic Byron Holiday. When can we expect you? - Group restrictions apply. Family groups only.